By the time you read this, you are probably snoozing guilt-free through your alarm clock or lazing around at home or outside, making the most of another public holiday. In the meantime, several rituals will take place that many, if not most of us, won’t even be aware of. The Parliament will hold a now traditional formal ceremony: the President, on a pulpit in a sea of red carnations, will deliver a speech sending a roll of subliminal messages to the government, various MPs and other high figures of Portuguese democracy, who in turn will take all the hints by looking down and casually adjusting the carnation on their lapels, wishing they could spend Freedom Day in the spring sun. RTP will probably broadcast Capitães de Abril, Maria de Medeiros’s debut feature film, which in spite of being fairly recent has now become this holiday’s equivalent of The Sound of Music or Home Alone at Christmas. I find it slightly romanticized, but it does depict with detailed accuracy most of the events of that day. In the afternoon, several rallies will march down Avenida da Liberdade. Kids often like to do so perched on the assault tanks, the so-called chaimites. Ironically, these same vehicles were used widely in the colonial war in Africa. But early on that spring day in 1974 they transported troops, spearheaded by the selfless captain Salgueiro Maia, into Lisbon and escorted then-Prime Minister Marcello Caetano out of public life and into exile. The Portuguese take this march as a great opportunity to publicly voice their protest or support in favor or against whatever we like: the government, the EU, the IMF, world trade deals, the end of various conflicts around the world, a country’s right to independence, banking lobbies, environmental issues, with climate change on top, saving agriculture in Alentejo, saving textile industries in the North, unemployment, LGBT rights, gender equality, immigrants’ rights, higher pensions, trade unions, more options on Netflix (ok, I made this one up), etc. There is no censorship. Some topics have changed according to current affairs over the past four decades. For example, I’m sure Trump will make his first appearance this year. The opportunity to do so, not just on April 25th but all year long, is now taken for granted by the younger generations. And that’s actually a good sign. But it also means that the significance of this holiday and its collective memory slowly fades. I sensed that again earlier this year when Mário Soares passed. This is going to be the first 25th of April celebration without him. In January, when Soares died, TV interviewers asked teenagers about what he represented for Portugal’s recent history. They often gave vague answers. It struck me that none of them were even alive or remember him first as prime minister and then as president. People my age didn’t get to live through the Revolution, but we grew up with Mário Soares leading an established democracy. A household presence, a quirky, sometimes embarrassing, but always familiar character with a wise nonchalance. A bit like an uncle who’s just always been part of your life. (Full disclosure: Although I just called him “uncle” and we share the same family name while our respective parents shared the same hometown, I should point out that we are not related whatsoever). Clean? Have you checked behind the ears? What about the dictatorship? What about PIDE, the so-called political police? What about torture, prison sentences for expressing an opinion, exile, the blue pencil of censorship, the gagged population living for the day, the smothering of arts, ideas, and knowledge, all with the complicity of an overbearing church? What about dire poverty, illiteracy, child mortality, child labor, people dying of tuberculosis? What about the lack of opportunities, the denied rights and protection of workers at the hands of unscrupulous bosses, the absence of social mobility, the rife bribery and the privilege a mere family name could give someone? What about the women, whose prospects in life were narrowed-down to a role they might not want to play? What about the men, most of them denied a proper childhood and then sent to fight a losing war for an already lost empire, stupidly waged on the few people in the world we can still call our brothers nowadays, only to get killed or return crippled and mentally scarred for life? What about the fallacy and humiliation of being orgulhosamente sós (proudly alone) of having to escape the country out of despair, and, without the right background, being subjected to further humiliation abroad? What about the reigning hypocrisy and the hopeless resignation? Always check behind the ears. of all military commanders to avoid any confrontation with the Armed Forces. Apart from being unnecessary, such action would only create or aggravate serious divisions between Portuguese people, which must be avoided at all costs. It is because of our concern to spare Portuguese blood that we are appealing for a civic spirit. All medical personnel, especially those in hospitals, should hold themselves ready to give help, though it is hoped this will not be needed. To all political and military forces, the Command advises maximum caution to avoid any action which may be dangerous. It is not our intention to shed blood unnecessarily, but if we meet provocation we shall deal with it. I can’t help wondering who could have heard this at that time: bakers, lorry drivers, security guards, hospital workers? I keep imagining someone on the way home teetering on the cobblestones of Chiado or Baixa after a night of drinking, completely unaware and unsuspecting of what was going to take place on the same streets later that day and how his life was about to change for good. A few hours earlier, at 00:20, what would be the second signal to the rest of the troops was aired by Rádio Renascença: Grândola, Vila Morena, by Zeca Afonso, a banned song by a folk musician banned from airplay by the Estado Novo regime. Most of José Afonso’s repertoire was very subversive. But the revolutionaries chose this song in particular for its power to become a rallying cry. This signal was the point of no return, indicating the revolution was underway and would not be stopped but by force. Fortunately, it turned out to be barely necessary, largely due to how the population joined in spontaneously and peacefully on the streets, completely ignoring the MFA’s request to stay home. The people of Lisbon stayed true to themselves by not observing the rules , but for a good cause. The Carnation Revolution was entirely bloodless but for the four people PIDE executed before surrendering. The first signal had aired on the radio station Emissores Associados de Lisboa at 22:55 on April 24th, the night before, calling out to all troops involved to get ready. That, too, was a song: E Depois Do Adeus (And After The Farewell) by Paulo de Carvalho. Paulo de Carvalho’s career as a vocalist and songwriter is worthy of a great deal of respect. This song, however, was the Portuguese entry to the Eurovision song contest of that year, with just the right dose of cheesiness and musical arrangements so typical of that television competition. It has that particularity of not raising any eyebrow: it doesn’t appear political or revolutionary or socially-minded. Then again, many artists who aimed to send out a message deemed subversive by the Estado Novo regime had to be very subtle to escape censorship. Carvalho’s song is about the end of a relationship, finding oneself alone, uncertain about what the future holds and looking back with nostalgia on days gone. But it also has a strong sense of closure. It suggests willingness and has an undertone of anticipation. Like a page is being turned, a nostalgia for something past making way to a nostalgia for the future. Any future. I can’t help drawing a parallel with the change the country was about to enter, turning a page not only on the decades of dictatorship but also on centuries of history. We were eventually going to turn towards Europe again, for better or worse. There was a lot of catching up to do. It would take another two years of confusion and heated debates, to say the least, until democracy was fully restored. In April 1974, I was nothing but a fetus thousands of kilometers away, with hardly a country of my own, kicking my time closer to the dawn of my own life. Every year around this time, I’m reminded of that and I see another parallel with that dawn, so thoroughly and beautifully described above by Sophia de Mello Breyner; that dawn, with such perfect timing, clearing the path for a new era, a renewed country. The only Portugal I knew and was privileged enough to be given, like many kids my age, all Filhos da Madrugada (Dawn’s Children), in the words of Zeca Afonso again. April 25, 1974, was a Thursday. Well, just like the Old English nursery rhyme says, Thursday’s child has far to go. Needless to say, it hasn’t been perfect. But we have options. Freedom is sweet. Freedom is everything. 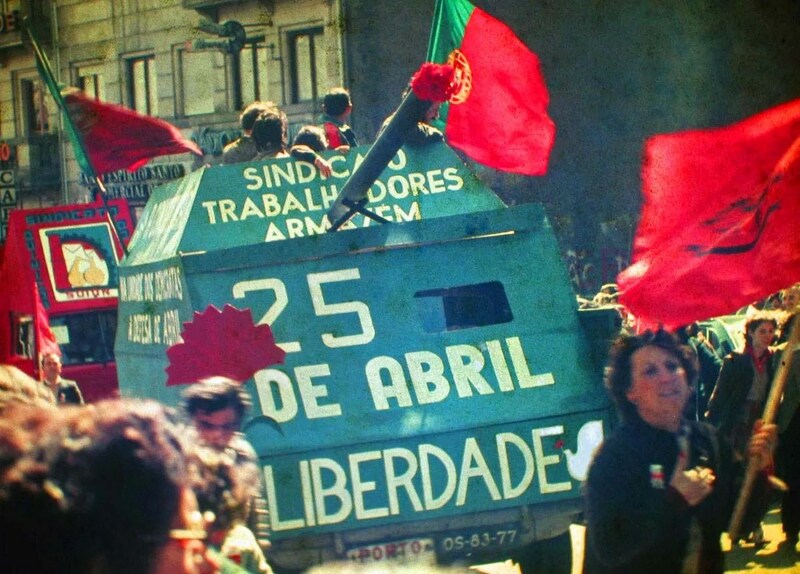 25 de Abril sempre. Viva a Liberdade!